This is another hand selected jewelry/investment grade natural Australian gold nugget. 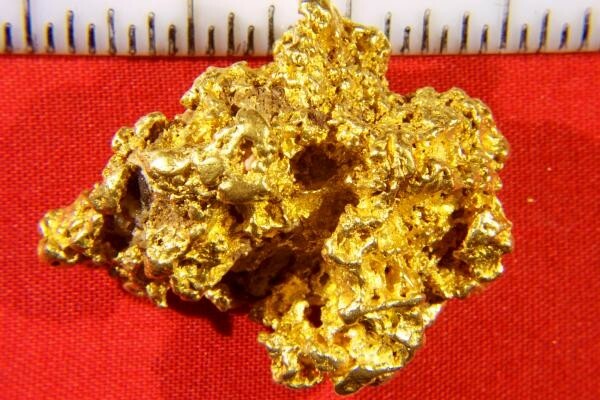 At 51.3 Grams (1.65 Troy Ounce), it is a large gold nugget at 1.5" (34 mm)long x 1.25" wide x 5/8" thick. Feels real nice and heavy in your palm. 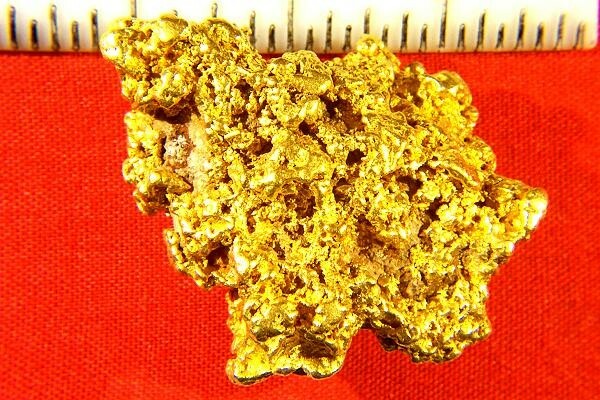 This is a really beautiful gold nugget. The color and shape are both stunning. This is a great way to invest in gold. Unlike gold coins where there is no limit to how many they can make, natural gold nuggets are being hoarded by collectors, and most of the easy to find gold nuggets have already been found. It is a rare find for a prospector to find a gold nugget over a couple of grams in size. Most of the gold found today is fine gold. This gorgeous gold specimen from Australia is 95% to 98% pure (22 KT to 23 KT).